The exhibition will present a network of relations between four moments through the installation of four slideshows of archival material: two artworks that happen to be slideshows and two sequences of research slides taken by art historians, both with a lecture as soundtrack. The artworks are Projected Non-Hapenning (1952-1967) by Ad Reinhardt and Hotel Palenque (1969-1972) by Robert Smithson. Both art works take the form of art history lectures presenting slide sequences and are indebted to Kubler’s The Shape of Time. One of the slideshows is composed of photos taken by George Kubler in Portugal, between 1952 and 1957 while researching about Portuguese architecture, the soundtrack will be composed by sections of a lecture that Kubler gave at the Yale School of Architecture in 1974. 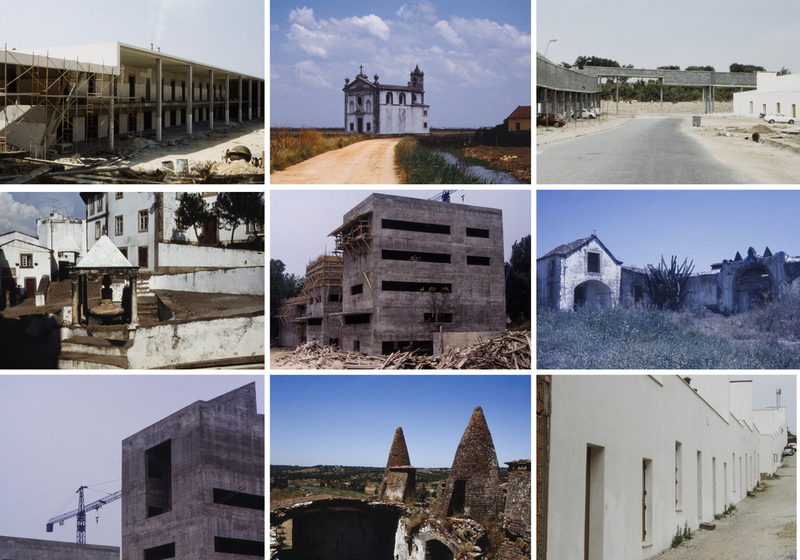 The other slideshow is composed by images made by Paulo Varela Gomes and João Vieira Caldas in 1990 while researching for the exhibition Points de Repère: Architectures du Portugal shown in Brussels at Europália 1991, and the accompanying soundtrack will be part of the keynote lecture that Varela Gomes gave the EAHN 2010 conference. The research will be centered on how the study of Portuguese and Latin American architecture permeated George Kubler’s development of a new philosophy of art history subsequently defined in The Shape of Time (1962). Moreover it will address the historiographical effect that Kubler’s work had in the development of Portuguese architecture in the post-1970s. This project has many connections with different branches of scholarship, since it comprises a relatively wide set of research fields — historiography of architecture, history of colonial Architecture, the creation of the narrative of late modernism and the history of architecture in Portugal between 1970s and 2000s. Moreover this project will focus on Kubler’s interest about artifacts produced in moments and places experiencing relative scarcity. Therefore this research will also add to the studies that focus on the correlation between times of scarcity and the practice of design. This thesis explores how the concept of landscape was significant during a section of historiography of modern architecture, between 1945 and 1985. I am considering landscape primarily as a methodological tool—as a system of organization—and secondarily as a substantive and physical space, as it is usually understood in landscape architecture scholarship. The thesis has three main sections; each examines a conceptual shift in architecture correlated to the use of notions of landscape. The first refers to the polemics of the picturesque landscape as the Architectural Review revived it in the 1940s. The second focuses on the use of landscape as a method of organising multidisciplinary knowledge, as in the anthologies of essays assembled by Gyorgy Kepes. The third focuses the on the shift that occurred in Reyner Banham’s work, from the desire to change the realm of architecture through disciplinary expansion in the early 1960s to the aesthetic appreciation of the American landscape and the desert in the early 1980s. The thesis shows how the use of landscape as a conceptual tool has forwarded late modern architecture from its original state of introspection to a possible expansion in many aspects— disciplinary, formal and theoretical.